Do you want to know what is the best way to scan a lot of photos? Actually, it depends. If you have a flatbed scanner and a bit of free time then you can start scanning old photos immediately. If your budget is higher and you're not afraid to let go of your old photos, then you should probably use a photo digitizing service. Digitizing photos in the comfort and safety of your home is a great idea. But how do you do that quickly and efficiently? 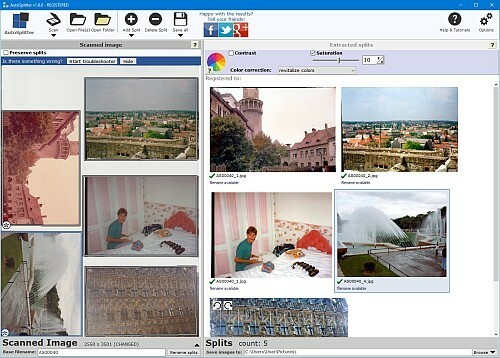 This software scans several old photos at once from your flatbed scanner and separates them to individual photo files. These photos will also be automatically post-processed by digital image enhancement algorithms to get rid of fade. Your photos will be revived to let you enjoy them in good quality. The process of converting old photos to digital copies is called scanning - you need a flatbed scanner to do that. Most families own this handy device, but usually it comes with bad software which is unable to speed up the process of scanning properly. Any scanner can be turned into the best scanner for photos with this photo scanning software. In order to copy your photos to your computer quickly you need to scan multiple photos at once. Put several photos on your flatbed scanner's window and scan. You will have multiple photos in one photo basically. This is where AutoSplitter steps in - it will automatically separate your scanned photos. This is the best way to copy old photos to digital format. I'll quickly tell you in a few paragraphs why AutoSplitter is the best way to digitize old photos. All these features will help you to scan old photos without hassle. AutoSplitter comes integrated with 2 standard scanning interfaces: both WIA and TWAIN have been implemented to provide high degree of compatibility with a large range of flatbed scanner devices. You can set physical scanning resolution of up to 1200 DPI. Higher resolution scanning takes much more time but the quality is going to be amazing. Of course you want the best possible quality when scanning your family photos. This software also offers full page scanning for traditional scan-into-file functionality for office use. Document scanning is easy. Supported devices: all popular brands supporting WIA and/or TWAIN interfaces. Bed size of up to A3. Scanners integrated into multifunction office printers should also work without problem. Wands, document feeder based scanning and commandline based file processing are not supported at the moment. Many people have already scanned in tons of their old photos and saved them into files to their computer. Often they have scanned several photographs in one image. Cropping all these photos and saving them to individual image files would take a lot of time and effort. With our software you can open a single previously scanned file to autodetect individual photos in the image. AutoSplitter has been developed with batch scanning functionality in mind. This also applies to processing of pre-scanned image files. This utility can open a whole folder of pre-scanned photo files at once. We let you select multiple files or a single folder full of prescanned image files and extract individual photos. The software will let you review all the automatic detection results and you will be provided an easy way of adjusting the cropping areas and digital post-processing to your liking before finalizing the images. Autodetect multiple photos in one picture - this is the default mode of operation. Put photos in scanner, click scan, click all save photos. Done, they are copied to your computer. Reuse corners: this one is trickier. Put 1 photo in all 4 corners of your scanner, then scan. Click "preserve splits" option in AutoSplitter. This will remember where your photos had been located and assume that all subsequent scans will contain photos in the very same location and size. You can easily achieve 100% accuracy with this method, you just need to group your photos by size - scan the photos with identical dimensions in bulk. Full manual cropping: if you have to scan photo albums with noisy background, you might need to highlight all photos individually yourself. You can turn off autodetection in the Options menu to assist this process. Detect pre-scanned photos: some people already started to scan many photos but didn't know how to divide the scanned images into individual photos. Tons of images with several photos in them are waiting to be cropped. No problem, AutoSplitter can do that. Instead of using the scanner, you can open pre-scanned multiphoto images from your computer. You can even open a whole folder full of these images at once. Photos will be found and auto-cropped. You can review and adjust/confirm results afterwards. No other software can do this. Adjust edges, rotation angles of detected photos using your mouse. Just grab the corner or the edge of a detected photo and move the mouse to make adjustments. Quickly rotate detected photos by 90° in any direction to restore proper orientation. You will find this option in the right side panel of AutoSplitter. Mousing over detected, cropped photos will display quick rotation icons for all photos. Right clicking a detected split you can access an advanced feature menu. You can flip photos horizontally or vertically or snap detected photo to horizontal axis in this menu. If these simple transformations aren't accurate enough for your desires, you can further improve cropping by a few extra features. 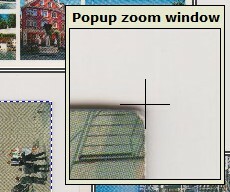 Popup zoom feature: a small 100% zoom-in window will appear everytime you drag a corner or edge of a photo for adjustment. This will let you quite accurately review the edges/corners of the cropping area. Doubleclick a photo in the left panel to open a dialog to finetune rotation and cropping of the photo. 4 corners of the photo will be highlighed under zoom and you can fine rotate the cropping area to achieve perfection. Zoom into output files to verify the results before writing them into file to make sure the quality is as desired. Photos often fade out and yellow with age. This photo scanning software provides some great tools to combat damage done by time. Images can be automatically color corrected without any further action - just leave color correction enabled - this is the default option. Yellowed out color photos often revive miracolously, but it works wonders for black and white photos as well. Alternatively (or in conjunction with color correction) you can also adjust saturation and contrast based on preset values for all output files at once. AutoSplitter supports all popular file formats both as input and output. Open and read prescanned BMP, GIF, JPG, PNG and TIFF files. Save your auto cropped individual photos into GIF, JPG, PNG and TIFF files. Some formats have individual output features. You can define JPG quality levels. DPI information is always preserved and saved with the output file (only applies to formats which support DPI information) - that is PNG, JPEG and TIFF. DPI information in image files lets you reproduce (print) these files in their original size at any time in the future if you wish. You can set up default filenames for generated output files. Mass rename option is available for your convenience as well. One click to save all photos at once. The software is easy to use - there are several video tutorials and sample images included to help you learn. Download and check out AutoSplitter photo scanning software now. Stop worrying about your photo collection! Secure it against loss, theft, acts of nature. Photos fade out with time - but not when they are digital!